Arrive in Cochin, the commercial capital of Kerala. This afternoon, you visit the Jewish synagogue built in 1568, walk to the adjacent Dutch Palace, and see the famous Chinese fishing nets. Stay overnight. Morning, transfer by road to Thekkady (120 kms / 3.5 hrs) to visit the Periyar National Park and Tiger Reserve. Late afternoon, enjoy a boat safari on Periyar Lake to view the varied wild life of this region. Stay overnight. The day is at leisure OR you may take an optional guided nature walk in the Periyar wildlife sanctuary or a boat ride on Lake Periyar. Stay overnight. 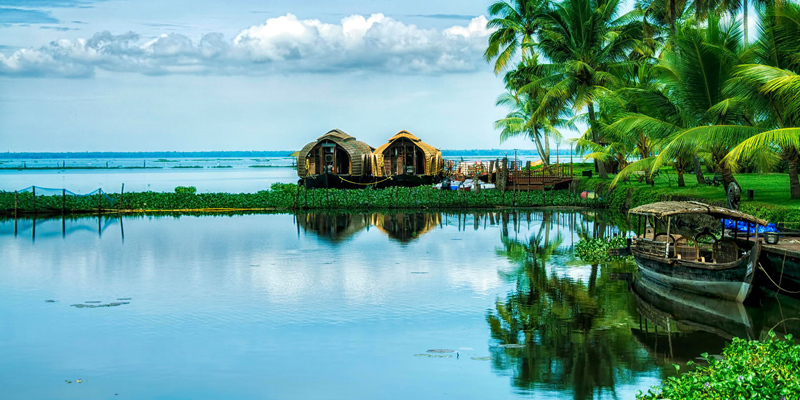 Transfer to Kumarakom (130 kms / 4 hrs), hidden away in Kerala's famous backwaters, is one of Southern India's most discreet holiday destinations, en-route you will stop to see the spice plantations. Stay overnight. The day is at leisure to relax by the poolside of your hotel OR enjoy an optional backwater cruise OR pamper yourself with some Ayurvedic beauty treatments. Stay overnight. Today, you will be transferred by road to Kovalam (154 kms / 34 hrs) one India's finest beach destination. Stay overnight. The day is at leisure to relax by the poolside of your resort OR take an optional excursion to Kanyakumari. Stay overnight. Transfer to Trivandrum airport / railway station. Tour ends with sweet memories.